thank you for all the info. unfortunately, I still have issues with my samsung galaxy tab 10.1 and becoming more and more frustrated. Contacted/chatted with Samsung and Adobe several times to no avail. your article was therefore very insightful. I tried several ways via KIES but still am unable to open Epub either through Ebooks or Aldiko via SD card. error message: failed to authorize device. Actually tab was never detected by ADE. any advice? thanks! The instructions in this post actually don’t apply to your situation. When using Aldiko on an Android device, you have to do your authorization in Aldiko itself. I’ll update this post to make that more clear. Have you every received an answer on this. I have been working on it for hours, and my ADE does not recognize my Samsung Galaxy 10.1 WiFi either. 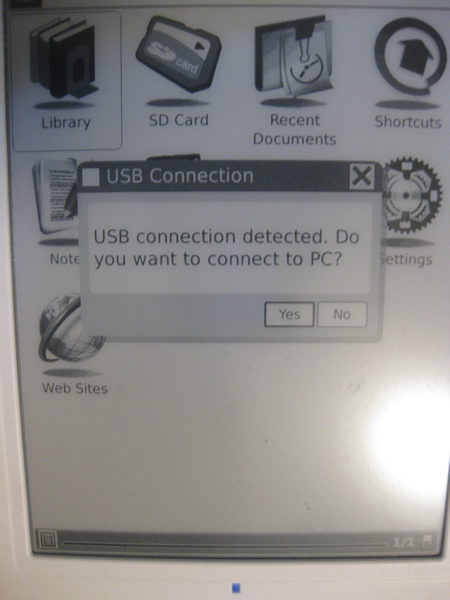 hi – I’m afraid this does not seem to work for the new Sony Reader wifi – I’ve tried everything and ADE just does not recognise the Sony at all. That seems strange. 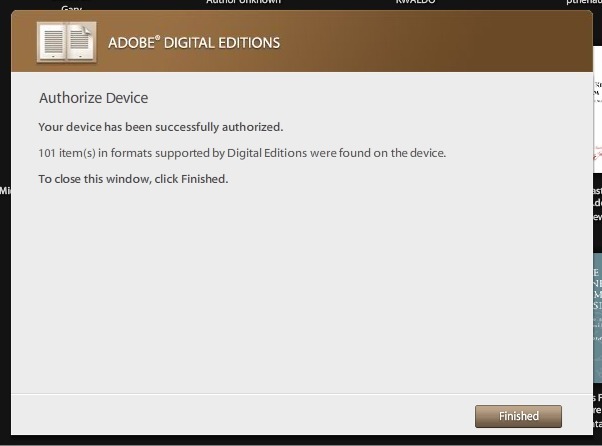 I don’t think that Adobe wouldn’t be supporting the WiFi model when it has supported all previous Sony Reader models. If that doesn’t help, I’d recommend contacting either Sony or Adobe directly. I had a problem with Aldiko and the “failed to authorize” error on my rooted Nook Color. Turned out to be a problem with the date (time zone) settings on the device. Found a tip about this on an Adobe forum. Here’s my story, and I hope it will help others. I have a rooted Nook Color, which I bought and set up where I live, in Dallas, TX. I already have Adobe Digital on my PC and Laptop and have a registered account. I bought an ebook while visiting Seattle, WA. I downloaded the book on my laptop without any problem and opened it in Adobe Digital Editions. I then copied the pdf file to an sdcard to place in my Nook. 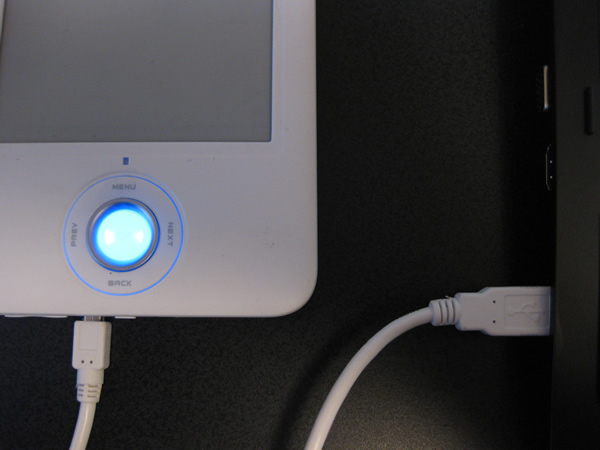 On the Nook, I had installed Aldiko for Android. When I tried to open the pdf in that software, it took me to a page to register the device. I entered my ID and password and kept getting the “failed to authorize” error. I could not understand why. I also tried to register a new account with a different email. Same error. I then looked online for help. Oddly, the comments section on the Aldiko support site for this problem is closed. After reading a comment about the time settings, I changed the time zone from what it was set on for home (Central time) to where I was at the moment (Pacific) and rebooted the Nook. When I went to register this time, it worked fine, and I could import and open the book pdf file on my device. Maybe this will work on other Android devices as well. Good luck. I saw your note warning not to click the do not authorize the device too late and I clicked it. Do you know how to authorize the device after selecting that option? I know you said it is a pain, but I have been looking for hours to try to find out how to authorize my ereader and have come up empty. To be honest, I don’t know. I only assume it’ll be a pain since ADE won’t prompt you to authorize your device anymore. You could try uninstalling ADE in the hope that it will get rid of that setting. Beyond that, it might be a matter of editing the registry, which I don’t have any information on or enough experience to really recommend. If you find the answer please post it here! I did try uninstalling ADE and it still didn’t work so as my last resort I De-registered my Nook with Barnes and Noble and then Re-Registered it and it finally brought up the prompt to authorize my device with ADE. All is good now! Thanks for the info in this article, and I wonder if anyone can help with my problem please ? 1. Installed ADE on my PC, and authorised that after a struggle (a large chunk of the Adobe website seems to be down at present so I had to go through their webchat support to get the ID set up). 2. Connected the Reader by USB. At this point, I get no further. The article suggests a window should open automatically to allow me to authorise the Reader but nothing further happens, all I see is a lot of blank bookshelves. If the window doesn’t open, how do I force-authorise the Reader ? All ideas gratefully received ! 1. I can’t log-in to Adobe account because of their system problem – is this likely to affect being able to authorise the Reader ? 2. The Reader contains some Sony proprietary software for transferring content that i was hoping not to have to use. Do I have to install this on my PC before I can expect ADE to work properly ? If I can’t get it to work, it’s going back for a refund ! I have a Color Nook and i already authorize my computer, but I did not use the Adobe ID. How can I change that. I’m not sure if I understand what you mean. 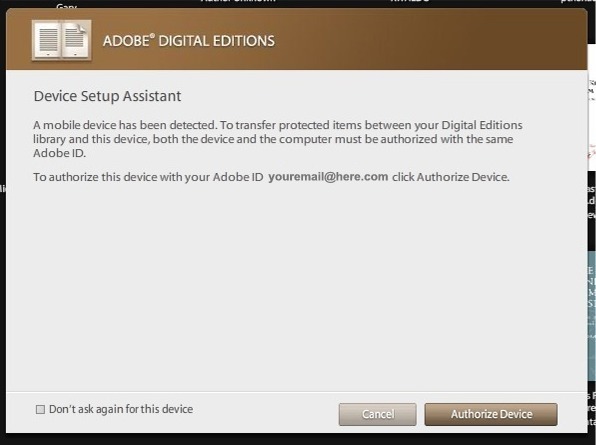 The only way to authorize ADE is by using an Adobe ID, so if you didn’t use one, you probably didn’t authorize it.